Now that we have some artwork on the stage, let's go ahead and save our work. 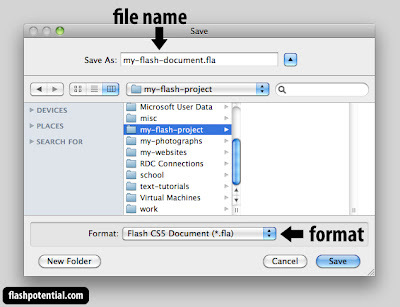 And in the process, we'll also learn about the two main file types associated with a Flash project. Let's first create a folder in which to save our document. Name this folder my-flash-project-[insert-your-name-here]. You can place this folder anywhere in your hard drive. Let's now save our Flash document. 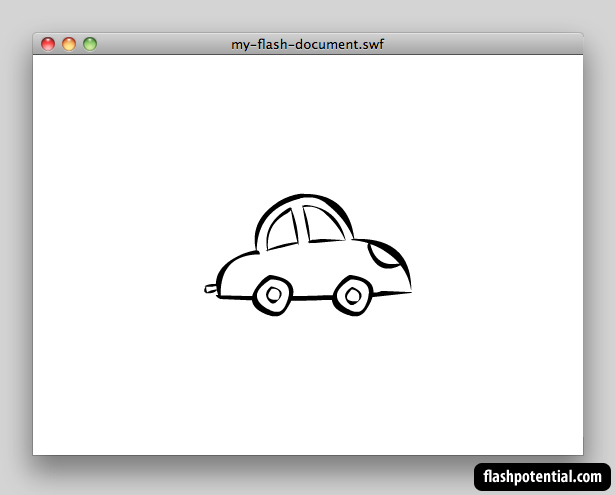 To save your Flash document, go to File > Save As. 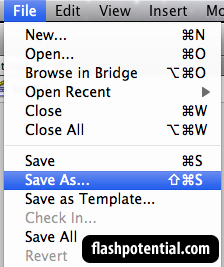 A dialog box for saving will come up. Let's name the file my-flash-document-[insert-your-name-here].fla. For format, make sure it says Flash CS5 Document. And then for the location in which to save the document, make sure you've selected the folder that you created in step 1. Then click on Save. After you've saved your document, open up your my-flash-project folder and take a look at the file you just saved. This is your Flash document, commonly referred to as the FLA file (pronounced ef-el-ey) because it uses the .fla extension name. This is your main document. From this main document, you can export your Flash project into a variety of different formats. Let's take a look at one of those formats in the next steps. 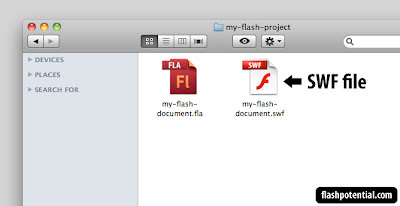 Go back to the Flash workspace where you have your Flash document open. From the main menu, choose Control > Test Movie > in Flash Professional. What we just did here is we previewed the movie. So you should see a preview window of your Flash project pop up. The keyboard shortcut for testing a movie is ctrl + enter (PC) or cmd + return (Mac). Whenever you test a movie in Flash, you're actually generating a new file from that preview. Let's go back to the my-flash-project folder and open it up to view its contents. You should now see a second file inside the folder. This new file that you see here is commonly referred to as a SWF file (pronounced swif). The SWF file is the compiled version of the FLA file. This is the format that can be embedded on a webpage. The SWF file is automatically generated whenever you test your Flash movie. If you make changes to the FLA file and then test the movie again, then the existing SWF file automatically gets updated with the new changes. So these are the two main file formats associated with each Flash project that you create. 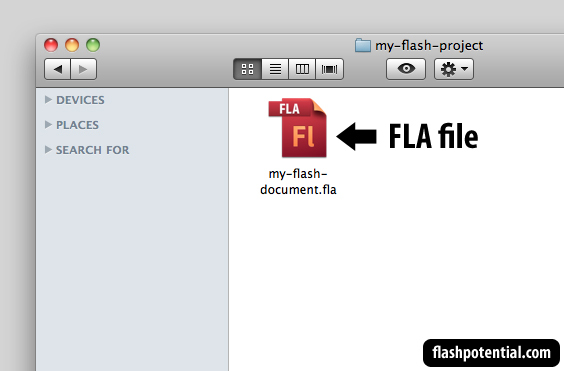 The FLA file is your main file, which you can edit using the Flash authoring application. And the SWF file is the compiled version of your FLA file, which you can embed on a web page. And that concludes this short tutorial series on Getting started with Flash CS5.